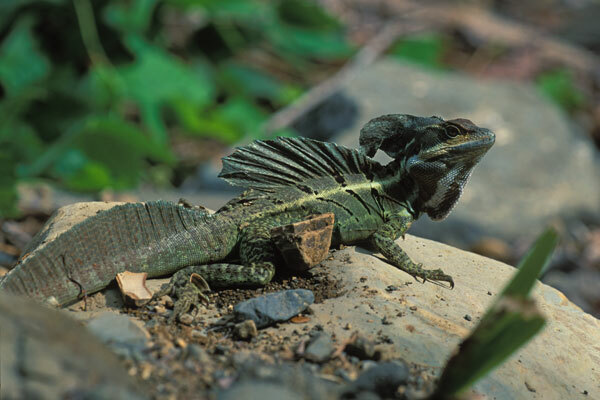 Adult male basilisks have tremendous crests and sails with which to impress female basilisks, and humans (I know I was impressed, anyway). 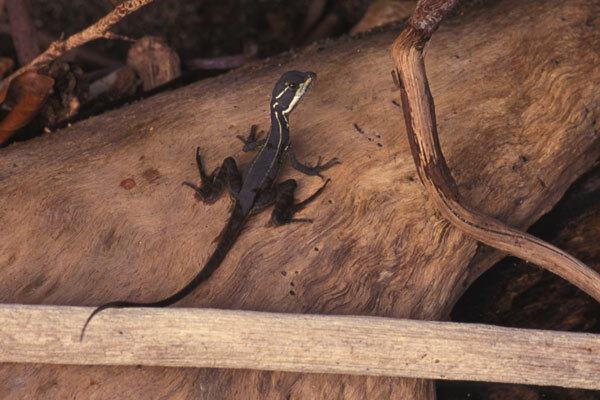 These lizards are extremely agile and speedy, but they're not averse to posing for a photo. The pair in the second photo are probably adult females, but could be younger males. 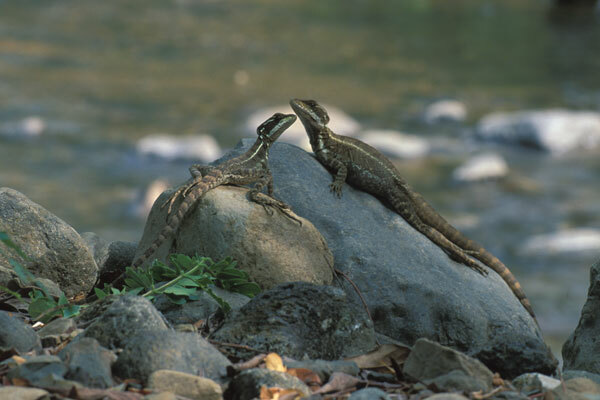 Basilisks are usually found near water, and these were no exception, basking on the rocks near a stream. 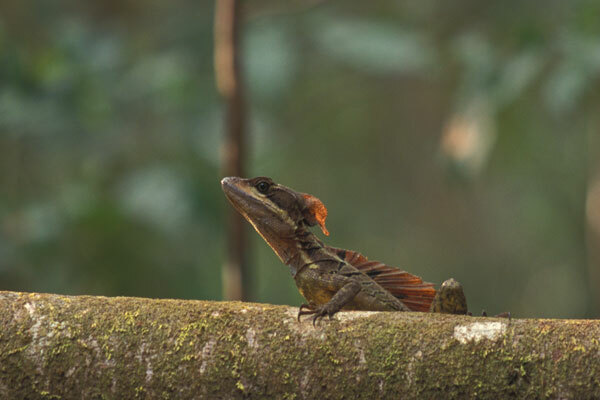 The little tyke in the top photo was perhaps the smallest of the numerous basilisks we saw on this trip, about six inches long or so including its tail. The bottom photo shows another adult male on a log in the forest, backlit by the late afternoon sun. The full-sized ones like this are perhaps 3 feet long including the tail. 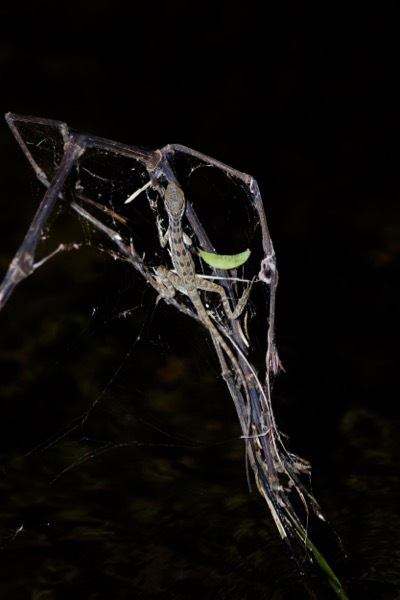 We caught this large female basilisk sleeping at night on a large leaf. When we took her photo by day, she sat still for about two shots and then bolted into the forest. An hour or two before dusk, a rain shower had just ended, and I started wandering around the hotel grounds to see what might be seen. 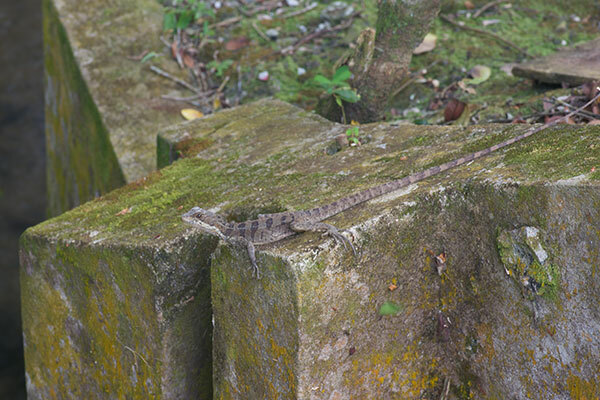 This adult female basilisk was taking advantage of the last warmth of the day on top of a thick concrete bridge support. At night, basilisks find what seem like safe places to sleep. 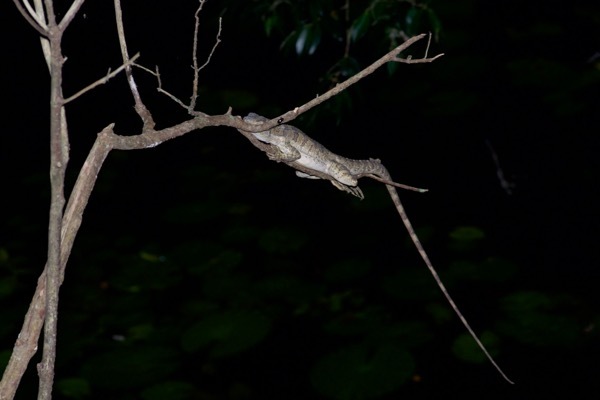 It would be hard (for example) for a snake that is large enough to eat this basilisk to actually climb the thin branches required to reach it. Sleep tight, mamma basilisk! 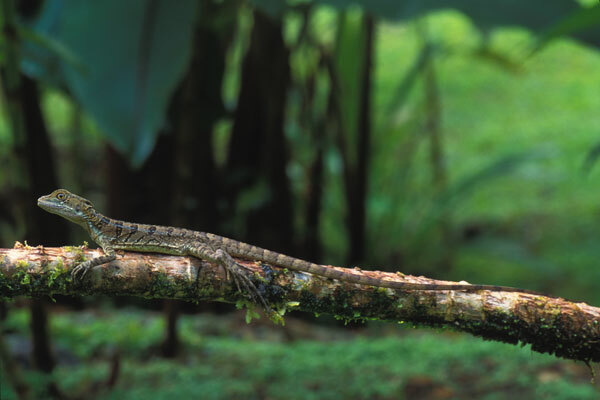 This baby basilisk has the same idea, but did not execute it very well. A minute or two before I took this photo, a false coral snake that was definitely large enough to eat this lizard climbed this vegetation and passed right over the unmoving lizard. Fortunately for the basilisk, false coral snakes are amphibian-eating specialists.